Steven715 had the most liked content! Hello there this is my first blog or even writing anything like this so I hope that it turns out OK and more importantly is easy to understand for someone that is this as a guide. A special thanks goes to neilsri130 as this was originally his idea I just put together this blog of my representation of his idea. OK so here goes. Things that you will need: 1 Meter self adhesive door bottom draught excluder (You don't need the glue as shown in the picture but this can be used if you wish) Philips head and Bladed screw driver A Stanley knife or equivalent The Mrs Hair dryer About 3 hours Step 1: Make yourself a nice cup of tea. Step 2: (If you don't have the centre console between the floor and the bottom of the dashboard then you can skip this step) Pull away the gear stick gater then grab your bladed screwdriver and carefully pry on the top of the plastic surround of the gear leaver/gater plastic away from the bottom cubby hole. Hopefully the picture will be more clearer. Then remove the 2 screws that this cover hides. The cubby hole is hocked in so you will need to slide the cubby hole forward then pull up this should come away. You can see the slots that holds this in in the next picture. Step 3: Pull off the plastic leavers off the Heater and air divert-er then remove the 4 screws that hold the lower part of the dash in there are 2 at the very bottom one on top and at an angle in the rear screen demister and one at the same angle where the choke leaver is. If you have a fuel injected car there maybe a cover that needs to be pry'ed off to gain access to the screw. Step 4: Remove and disconnect the radio then the clock. Undo the 2 screws at the bottom of the panel. Pry the top of the panel and bring the top part of the panel out this will then lift out as seen here. Here is a couple of pictures of what it looks like behind the panel. Step 5: Remove the 2 Air vents the right hand side one you push at the top and bring it round 90 degrees and then the vent will push up to un-clip the left hand side one you push down the opposite way these can be fiddly especially the left hand side one. When these are out clean out all the old foam from the grove where the foam is held. I washed mine with warm soapy water and used the wife's hair dryer to dry the plastic especially inside the grove. Step 6: I then prepared my draught excluder by cutting it in to 4 lengths 2 short ones for the sides and 2 longer ones for the long edges I then folded the draught excluder in half and used the sticky side to stick it onto itself the short sides i pushed in with a small screw driver. I put the folded edge to the top against the plastic to make a seal when the flap is closed The long edges I pushed in enough to get a good seal agents the sealing surface I checked this by holding it up to the light and see if there was any daylight coming through. This took some time to get right. The draught excluder is only friction fit into place I only used the glue to glue the side of the draught excluder that did not have the tape on but this is just me being a tight arse! You could use the glue if you wanted but I cant see it moving I will let you know if this is the case. Here I am holding it up to the light to see if there are any potential leaks. This is the best time for adjustments to avoid any whistling when the fan is going full speed and when the vents are closed. Here is what it looks like when the vent is open. Installed back into the car for testing. Closed air vent. Now just reinstall everything back into place. I hope that this guide will help someone out. If anyone has anything to add that may help others with this then let me know. Edit, as Photobucket has stopped hosting images I have now moved all the images over to postimg hopefully everything is working and the photos come out in the correct order. Also todays date is 5/12/2017 and to this day my vent is still working as it should but I do have one warning don’t put the strip in to tight otherwise the vent will be hard to open and close this can be squeezed in a bit more if this is the case. Nice save! Can't wait to see the pictures nice low mileage to. Hi you asked me about the estate? Yes it should cope OK with the travelling. The exhaust is raspy but not too intrusive. Just don't race away from the lights all time. Hello mate sorry but i think that you have the wrong person as I haven't asked any questions. Yes it hard being the new boy . I take that bit back it being VBOAs fault (sorry my bad) It really is a shame that Billing has made this decision. I was looking forward to to scratching around for parts and I was able to get a couple of little bits to keep me happy. It will be interesting if the VBOA decides to move but like I said Billing seemed very well laid out and the access was really easy we will have to wait and see what happens. I liked that I am after all an odd ball My Mrs says that i'm old before my time so based on that I think i'm in. I to hope you can make it to Greg It will be nice to meet you all. This was my very first time visiting Gt Billing and on first impressions I thought the whole ground was extremity well set out there was some bits we missed though (towards the exit) because it looked like it was just camping grounds Doh! However I really was expecting better from the Auto jumble this for me was very disappointing! not if you have a Nova though! the guy selling most of his stuff for a quid just about made up for it but still disappointing, I know this is no ones fault except for VBOA wanting a high liability insurance cover. I wished I had met more of you but me being a bit of a shy guy I did not want to intrude on what looked like a private area (Totally my fault and I regret it and take full responsibility) The chaps that I did meet I really enjoyed your company and chatting with you, I would have stayed longer at Billing but the Mrs was getting board :-( at least now I know how it works and to grow a pair and come and say hello to you all as on here you all sound like wonderful people and I would love to talk about Cavs with you all. I am pleased that I met with Andy when I first pulled up as I would have felt a bit funny parking in an area with out at least asking first and letting someone know who I was but again this is just me! After reading the earlier posts on here I now know to bring some BBQ stuff with me and burn some burgers etc. :-) I promise you all that I will come and say hello next year and I will bring a chair with me next time! On coming weeks towards VBOA I was nervous about bringing my Cav as I know its not perfect but again after seeing Andy giving his Cav a wash I was pleasantly surprised and realised that is what these shows is all about not to show how good your car looks but getting stuff done whilst your there and getting some club members to help out with there expertise. I found the marque on the Manta club a bit over the top in a way i felt like we may have to pay just to look around them lol. I think for us a simple banner over where the bbq is set saying along the lines "MK2Cav.com come and say hello" Bottom line is I enjoyed it and to some extent and my amazement the Mrs enjoyed herself to I would have loved it even more if I kicked myself up the arse and came and say hello. You all have some very good looking cars indeed they all have there own personality's. As for Facebook I can't really comment as I don't do Facebook Flicker for me is a stretch lol I have used forums for as long I have been on the internet my biggest problem is as you can already tell I am no story teller. But I love to read the information, storys and problems on here and I do try and help out to the best of my ability to give back to the comunity when they helped me. Nice! Keep us posted we like to hear how people are getting on and there projects. 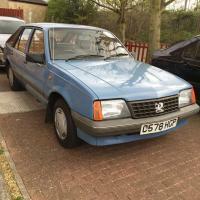 Welcome to the forum looked like s really nice buy, I felt the same way on price when I purchased mine but like people said to me at the time if your happy with the car then price doesn't matter. To be honest I have not looked back I still really enjoy driving mine and I know you will. steve. Wow looks cracking! Good find I will also love to see the outcome. What are your plans? Hello and welcome back, Bolly does look good I remember seeing the pictures on eBay not so long ago. Your lucky to have it I'm sure Dawn done everything that was needed doing to it. To get membership just click on store and the options are listed out there. Hopefully this will help you. steve. Sorry I'm a bit late to the party but I would be interested in updates on this I enjoy projects like this, Good buy Sal! Not many around now. Cant beliave that the break disks are different sizes though, a professional bodger at its best there. 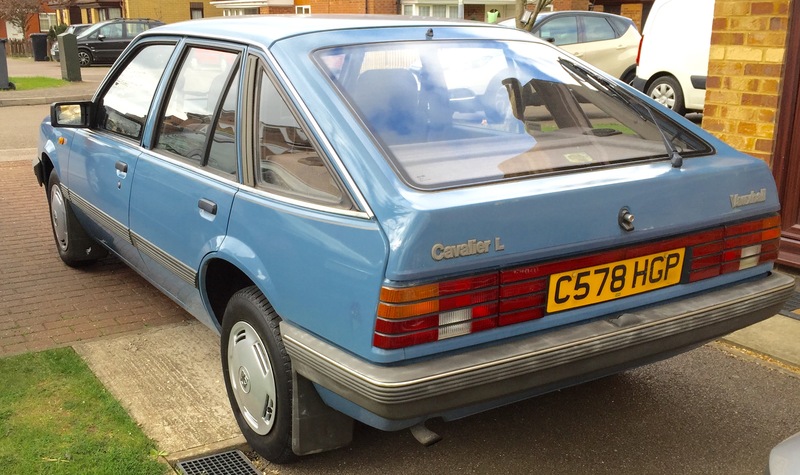 As of the 1st April my Cavalier will be all legal again for the next 6 months. Nice one I will look forward to it.